I finally got to see Infinity War and my emotions are destroyed! 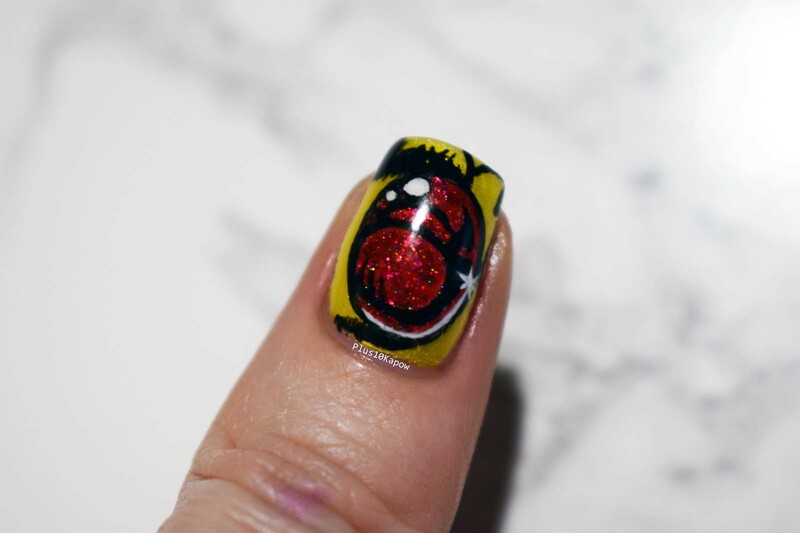 It is an awesome movie but I audibly gasped multiple times and stopped breathing a few times, so I wanted to do some nails for it. I also decided I wanted to go back to shorties for a while. 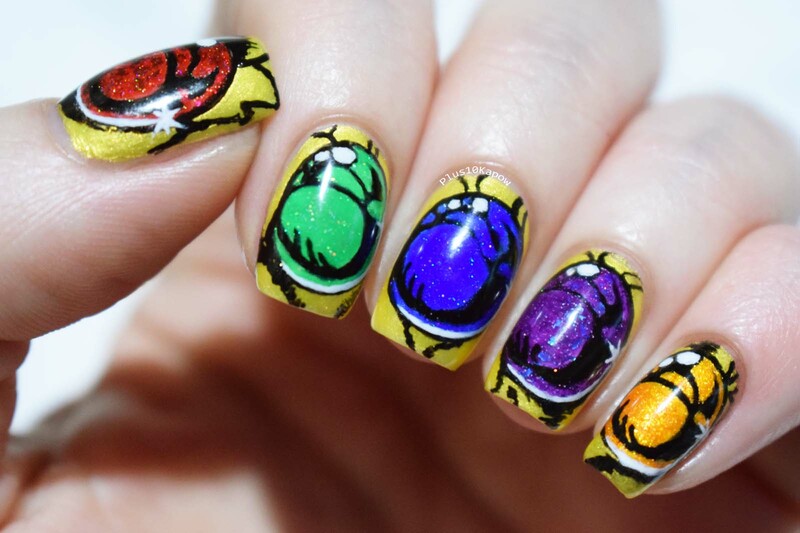 While these Infinity Stone nails are inspired by old school comic book Thanos, they are directly inspired by a patch and pin set from Clay Graham Art. I love the way the stone pins look and decided to give it a go. All of this was freehand and was done all the while my tremors were making themselves known. Why didn't I pick a hobby more suited to someone whose hands don't do what they are told 90% of the time?! Honestly though, I was gutted when I took photos of these because they just didn't look as good in the photos as they do in real life. Because I used glittery polish for all of them they look fab when the light hits them but that just didn't translate to photo. But ah well, at least I love them, innit?! Thumb= Reality. Index= Time. Middle= Space. Ring= Power. Pinkie= Soul Stone. It's definitely a Gauntlet to make Thanos a little bit jealous. 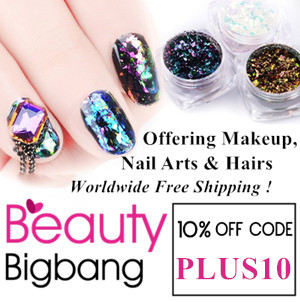 My thumb turned out to be my favourite, maybe it was because it was the first nail that I did and it didn't go wrong at any point. 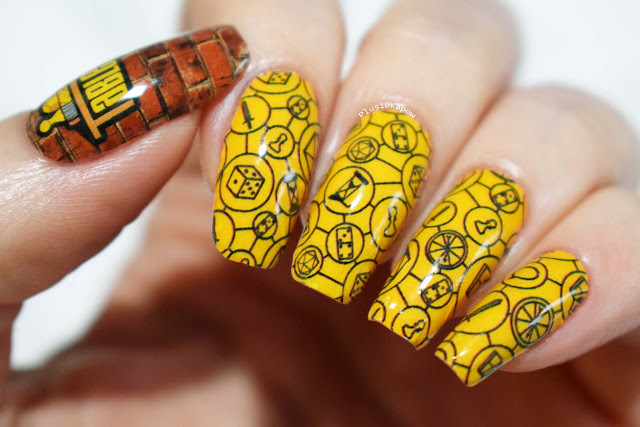 I really loved doing these nails too because it has been an absolute age since I sat down and did some proper nail art that took my most of the day and hopefully I can come up with some more nerdy nails because that's all I really want on my nails. Have you seen Infinity War? Thoughts? Thor: Ragnarok is still my number 1 Marvel movie, I think it's the best one yet! But Infinity War is definitely a close second.